Another weekend has flown past. I feel like I only had a one day weekend as I spent Saturday feeling very sick and sorry for myself. I had the awful sore throat again and was achy all over, so thought I was getting sick after only just getting better a few days before. After a few hours, I realised that I had (another) blocked milk duct making me feel so terrible. I offered Zoe an extra breastfeed, which she took (thank goodness!) and within 30 minutes I was almost like new again. The sore throat is persisting, but not getting any worse at least. Today, Abbey, Zoe, my mum and my Grandma went to the Fairy Floss Handmade Market. There were so many fantastic stall holders there. I could have bought so much stuff - but I do not need any more stuff, so I only came home with Christmas and birthday presents for other people, and a mermaid. Did you notice the mermaid in the photo? 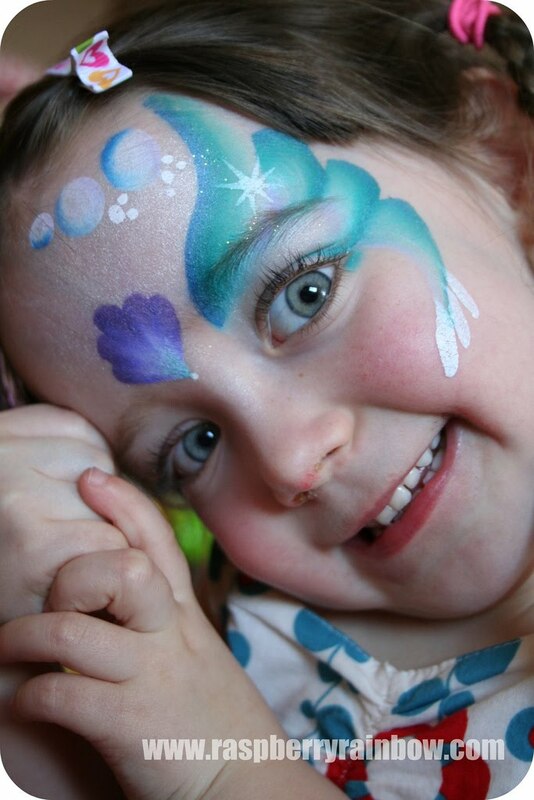 There was a Pixie face painter at the market, she is the best I have ever seen. To me, it looks like it would have taken hours to paint Abbey's face with so much detail, but I was there, and I saw her do it in 5 or so minutes. The happy mermaid is now sleeping, and she told me she wants to stay a mermaid forever. We'll see about that. Pop in and visit Claire and see what other peeps have been up to this weekend, and join in with Point & Shoot over at Fat Mum Slim. Glad you're feeling slightly better now....and I too have an annoying lingering sore throat! Have a fab week Cat! Cat, it was so lovely to meet you and your girls in person. You are all delightful! Abbey makes a beautiful mermaid, great photo too Cat. Love markets and your mermaid is gorgeous! :-) Hope you are feeling much better too.